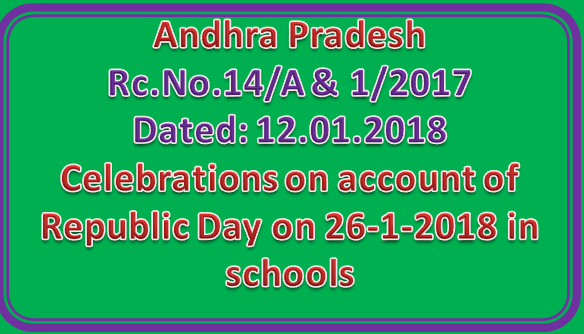 Sub:- School Education - Celebrations on account of Republic Day on 26-1-2018 in schools — Conduct of various competitions at school, complex, Mandal, Divisional and District Level - Instructions — Issued. The following sports have to be conducted at school, complex, Mandal, Divisonal and District Levels. — Out of the following sports, at least three sports have to be conducted to the students of 4th & 5th Classes at school, complex, mandal, divisional and district levels in the prescribed schedule. These sports should be organised by the Headmaster at School level, Complex Headmaster at Complex level, Mandal Educational Officer at Mandal level and Deputy Educational Officer at divisional level and Deputy Educational Officer, Headquarters at district level. Educational Officer, Headquarters at district level. 1. Kabbadi, 2. Kho-kho, 3. Basket BalI, 4. Volley Bali, 5. Hockey, 6. Football, 7. Handball, 8. Ball Badminton, 9. Chess, 10. Shuttle, 11. Discuss Throw, 12. Shot Put, 13. Javelin, 14. Long Jump, 15. High Jump, 16. 100 Mts Run. 17. 200 mts Run, 18. 400 mts run and 19. 4 x 100 Relay. Out of the following sports, at least five sports have to be conducted for the students of 9th & 10th Classes at school, complex, Mandal and district levels as per schedule. These sports should be organised by the Headmaster at School level. Complex Headmaster at Complex level, Mandal Educational Officer at Mandal level and Deputy Educational Officer at divisional level and Deputy Educational Officer, Headquarters at district level. 1. Kabbadi, 2. Kho-kho, 3. Basket Ball, 4. Volley Ball, 5. Hockey, 6. Football, 7. Handball, 8. Ball Badminton, 9. Chess, 10. Shuttle, 11. Discuss Throw, 12. Shot Put, 13. Javelin, 14. Long Jump, 15. High Jump, 16. 100 Mts Run. 17. 200 mts Run, 18. 400 mts run and 19. 4 x 100 Relay.